Loyalty Cards, stamp cards, coffee cards and the like are a super effective and simple way to increase customer loyalty, customer frequency and even transaction value in many businesses. The loyalty card encourages your customer to collect a stamp with each purchase (or a specific type of purchase such as Minimum $10) in return for a reward, bonus, free product or discount. Loyalty Cards are a great low cost sales promotion offered by most successful national retailers including Michel's Patisserie, Bakers Delight and Donut King. They are also an effective and low cost marketing tool for small businesses including florists, butchers, green grocers, clubs, hotels, pet stores, hairdressers, beauty salons, seafood shops, takeaway food shops and so on. Stamp and loyalty cards can also be used as a way to earn an entry into a competition or prize draw: EG: "Collect 5 stamps to go in the draw to win the weekly hamper." It is essential to print your loyalty card on a paper stock suitable for this purpose. Depending on how you plan on marking or stamping the loyalty card as to the different paper stock options available. An uncoated white board like a Systems Board allows you to ink stamp, write or mark with any pen, pencil or stamp. When you use a gloss or satin coated board, or a matt laminate, your loyalty card cannot be stamped so easily with an ink stamp or texter. When you use a matt laminate you can really only use a ball point pen to mark your cards and a gloss laminate - well you will have to use a hole punch for this finish. 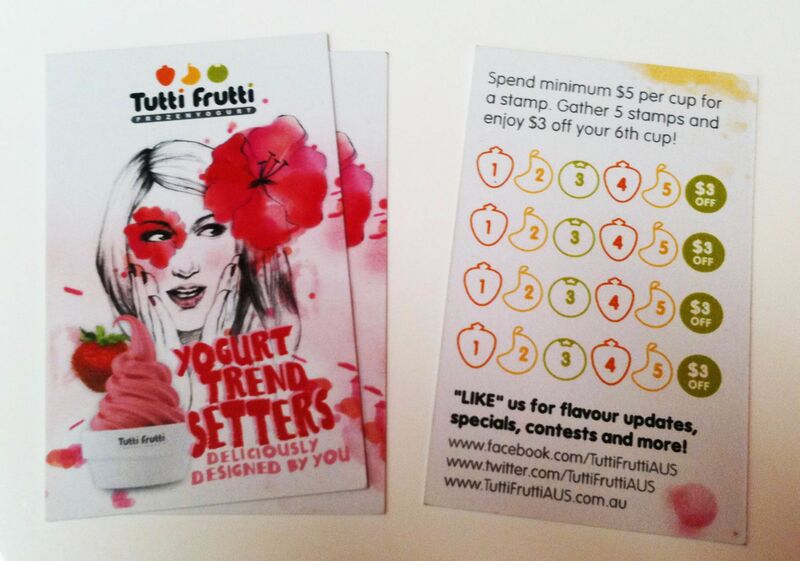 The Tutti Frutti loyalty stamp cards and self inking rubber stamps supplied above were printed on an uncoated board so that a self-inking stamp could be used to mark the card. We print loyalty cards all day long for delivery throughout Sydney & Australia wide with standard delivery from 4 to 5 working days from order. To discuss your Loyalty Card printing needs, or for a printing quote, call us on 1300 703 403 or REQUEST A QUOTE today.